Nvidia has been mentioning 3D Vision Window Mode support for games as an upcoming feature for quite some time and now it seems that it is finally making its appearance as the release notes mention 15 games that already support it. This means that you will be able to play these games in stereo 3D mode not only in full screen, but also in a window mode in stereo 3D while at the same time you may have other 2D applications also open. This seems to be a bit of a challenge as you have to define the apps that should be in 3D mode in order for things to work, so maybe Nvidia is working on another profiling method, or more like extending the 3D Vision profiles, with MMO games being the priority. The full list of games that should work in window mode in stereo 3D with the new driver is as follows: Aion, Crazy Racing Kart Rider, Crossfire, Dragon Nest, EverQuest 2, Guild Wars 2, NED, PopKart, QQ Dance QQ, QQ Xian Xia, Tian Long Ba Bu, World of Warcraft – Burning Crusade, World of Warcraft – Wrath of the Lich King, Xun Xian and Zhu Xian 2. As you can see from the titles here, there seem to be quite a lot of Asian games that don’t seem very well known, at least to me, with them also getting official 3D Vision profiles along with a few other games. The drivers also support stereo 3D window mode in Google Earth, finally. The new driver also adds support for two new 3D Vision projectors: Acer X1261P and Sanyo PDG-DXL2000. But more interesting and important is the significant update that includes support for more recent Mitsubishi 3D DLP television sets, including the 2010 series that also got a free firmware update to support HDMI 1.4 stereo 3D input. The full list of additional models that are now also supported includes: Mitsubishi WD-83838, WD-83738, WD-73838, WD-73837, WD-73738, WD-73638, WD-73C10, WD-65838, WD-65738, WD-65638, WD-65C10, WD-60738, WD-60638, WD-60C10, L75-A91. Nvidia Surround is also updated, with improved performance for 3-way and 4-way SLI configurations, as well as an updated 3D Vision Surround and NVIDIA Surround game support list, although the new list is still not available on Nvidia’s website. The release notes also mention support for some new 3D-capable LCD monitors, but these were actually added in earlier releases, so they are not entirely a new feature for the 266.35 drivers. The mobile version of the drivers has pretty much the same features and it also mentions added support for new 3D Vision notebooks: Acer Aspire 5745DG, ASUS G53Jw, ASUS G73Jw. Interestingly enough the mobile version does not mention the 3D Vision Window mode as the desktop version does, but that does not necessarily mean it is not supported. I’m sure that some of you have had their 3x 120Hz 3D-capable monitors along with two Fermi cards in SLI ready and waiting for some time, but now the driver version 258.69 is finally available with support for the 3D Vision Surround. 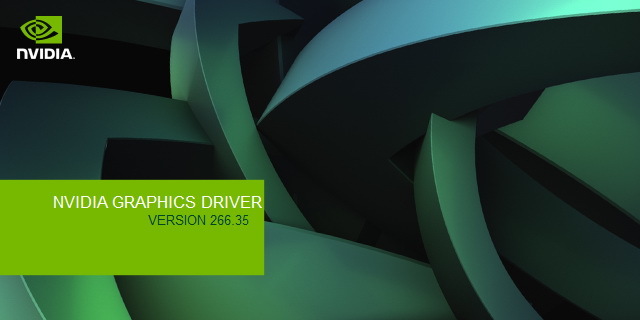 Now bear in mind that this is a beta driver and there is a GPU driver and a 3D Vision driver version 258.69 and you need both in order to be able to take advantage of the 3D Vision Surround technology supported in them. They are both packed as a 3D Vision Driver CD version 1.31 beta, so it is easier to download the full package all at once, as is has the 32-bit and 64-bit drivers all in one package. Besides the addition of support for the 3D Vision Surround technology, the new drivers also come with a fix for the problem with the ViewSonic PJD 6531w not being detected by the 3D Vision Setup Wizard. The new driver also adds support for new 3D Vision-ready projectors – Acer X110, Optoma GT360, NEC NP216. There are also two new 3D Vision game profiles for Alpha Protocol and Blur, along with updated profiles for the following games: Order of War, Serious Sam the Second Encounter, World of Warcraft.